The place for vintage amp discussion. when i do this, i see the variac needle jumping when i play. is this the same as what you do jnew? I love the name of this thread!! awesome. Regarding the impedance matching, I've read a couple of articles saying that there's no such thing... output impedance WILL vary a LOT also, and it is incredibly lower than the usual 4, 8, 16ohm that we see on the amp and speakers... not sure if that's true but using the variac LOWER than the 90V (15ohm reading dc resistance) tends to increase the impedance, isn't that right? Jnew did you try measuring your 2nd variac's output when the dimer is lower than 90v to see what happends? The old style variac I use between the head and cab doesn't have a meter or gauge so I won't see any needles bobbing around. As far as measurements, yes. The primary side (which would normally be the voltage in from the wall under normal operating conditions, or the male plug on your variac Rob) measures a steady 3.2 Ohms across the tip and sleeve with no changes as you dial the knob around. The secondary side (which would be the AC output under normal operating conditions, or the female socket on Rob's variac) swings all over the place as you move the knob around when measuring across the tip and sleeve. So running the head to the male side (or primary) first, can have a different tone than going backwards through the female side (secondary) first. It's a very noticeable difference. At least on my old variac but I suspect they would all behave this way. ok thanks - you've been telling me to reverse it and i keep not trying it. haha - got to do it now. played with it for a while last night - the interplay between, front end boost (blue mxr), amp voltage setting, speaker "voltage" setting... gives a lot of different avenues to get toward the tone you want - for instance in my setup, i can add bottom end by raising the setting on the speaker variac, or i can get it at the front with the mxr eq. it's a very interesting vibe that has elements of the tight balloon ed gets in the DD / FW era. That is exactly right. There is lots and lots of juicy goodness in almost any direction you go with combinations of stuff. And the best part is that it can be had at almost any volume too. So many myths busted about amp mods, master volumes, cabs cranked to the edge of destruction, etc. we all know the old saying about moderation. Somebody needs to get their hands on a Kemper and start profiling these various rig setups! That sounds fun twisty but, eyes ain't B knowin bouts no kind o profilin less'n U be talkin bout like dat security Gard always B unsnapp'n his holster ery time eyes walks in 2 da bank. Location: though I'm standing still, I'm in a moving place. mr.twistyneck wrote: Somebody needs to get their hands on a Kemper and start profiling these various rig setups! BETRAYED! DESERTER! A scalawag I daresay! jnew wrote: That is exactly right. There is lots and lots of juicy goodness in almost any direction you go with combinations of stuff. And the best part is that it can be had at almost any volume too. So many myths busted about amp mods, master volumes, cabs cranked to the edge of destruction, etc. we all know the old saying about moderation. ok - flipped it around backwards from what i had it and it does indeed sound better than ever. the other way it was leaning toward a cocked wha and i was having to compensate by dumping high mids at the 6band in front - but now... -->very cool. 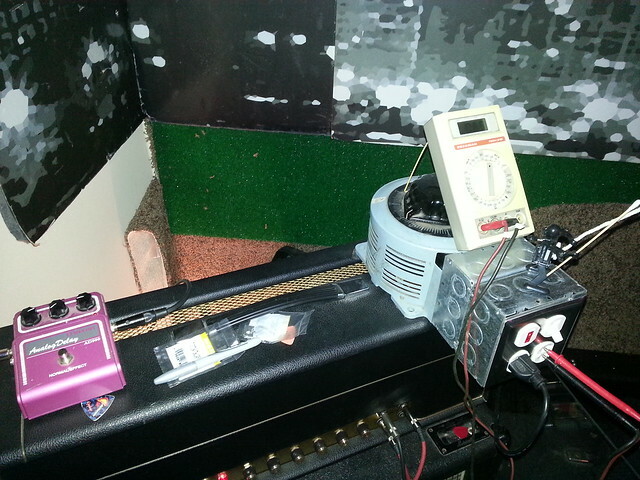 currently working with 90V setting on the amp to cab and 65V on the head - 4 tubes - feeding an 8ohm cab. will make a clip tonight. thanks for the guidance jnew. Agreed. Going backwards sounds warmer, fuller a more natural sounding. My preference as well. 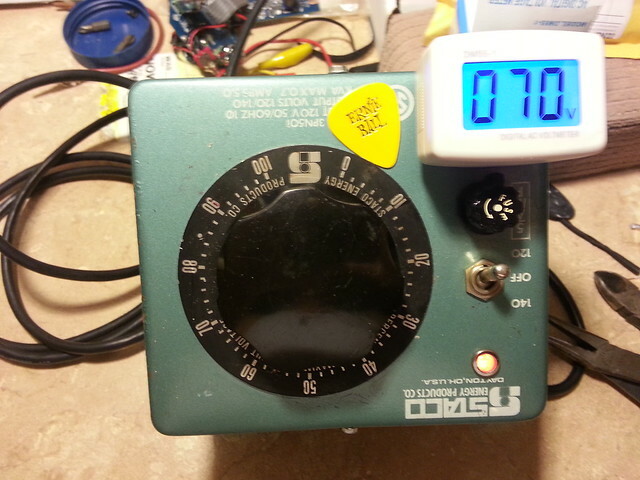 Btw, I'm as low as 70 on the knob, with the 2nd variac, for quiet practice volume and it works very nice. Very quiet with two tubes pulled and amp at 60-65VAC. Love it. Put that girl in play. They come in low & high voltage models, and from what I can see these are built pretty well for what they are. At less than $5.00 U.S. I'll be ordering a few more. Save your money and have patience. I ordered from overseas, otherwise they are nearly double the price.